Gabriel Constantin was immersed in the hospitality arena at a young age, working with his family’s business in Bucharest, Romania. After earning his degree in finance and management from the Ecological University of Bucharest, he pursued a career in the hospitality industry. He quickly moved through food and beverage positions in the U.K. and Ireland before moving to the United States in 2002. In early 2003, he was recruited to join Trump Hotels to oversee the food and beverage operation for the group’s Doral property, which underwent a $250-million transformation into a luxury resort with 700 rooms, 100,000 square feet of event space and a $30 million food & beverage budget. Before joining Trump Hotel Chicago, Constantin served as the manager of Trump Hotels’ Old Post Office in Washington, D.C., which opened in September 2016. All of our iconic hotels offer signature programs designed to ensure that every guest has a memorable stay. 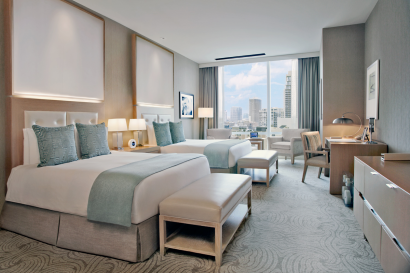 Each and every program has been thoughtfully curated to deliver unparalleled service and create the ultimate luxury experience in all of our 5 star hotel rooms. The Trump CardPrivileges Program ensures that loyal members receive a personalized experience with each stay, as well as special privileges and benefits. Trump Attaché delivers customized service to every hotel guest, while Trump Wellness helps them maintain, and even elevate, their own healthy lifestyle. For our younger guests, the Trump Kids program offers fun, kid-friendly services and amenities designed to help make the next family vacation a big hit. 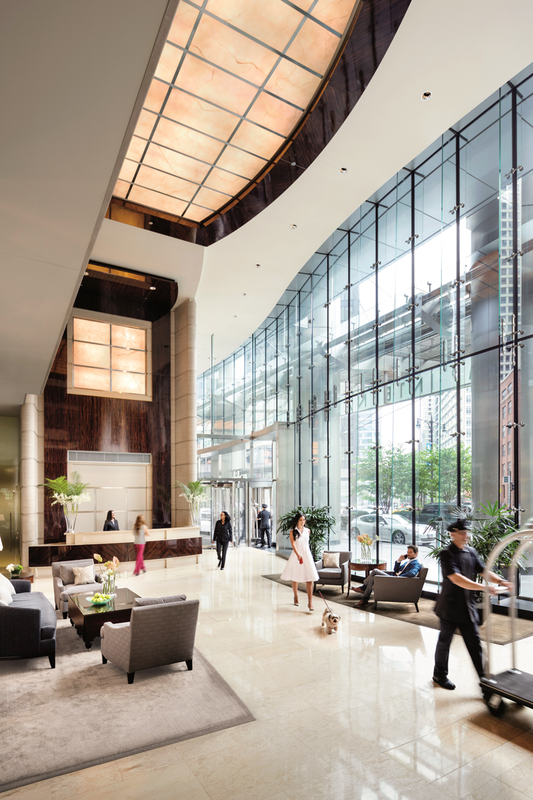 Trump Pets ensures that furry jet-setters feel welcome with gourmet treats, plush sleeping accommodations and more at our luxury pet friendly hotels. 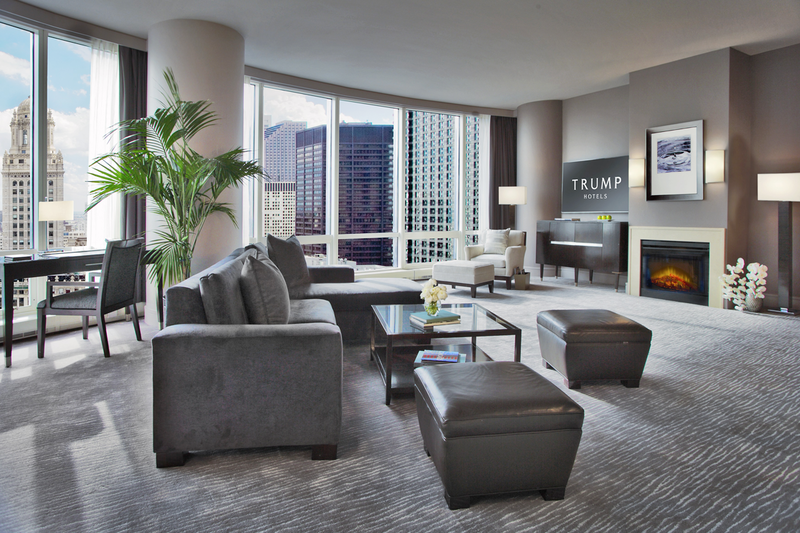 Poised along the Chicago River at the juncture of North Michigan Avenue and River North, Trump International Hotel & Tower® Chicago is the city’s most enviable address. 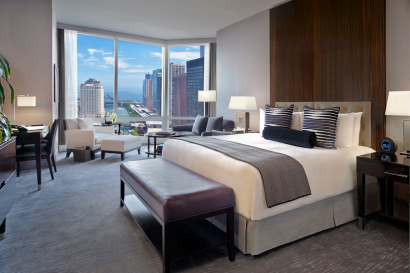 The lush, contemporary guestrooms start at a spacious 600 square feet and showcase panoramic views of the Chicago skyline, Lake Michigan and the Chicago River. 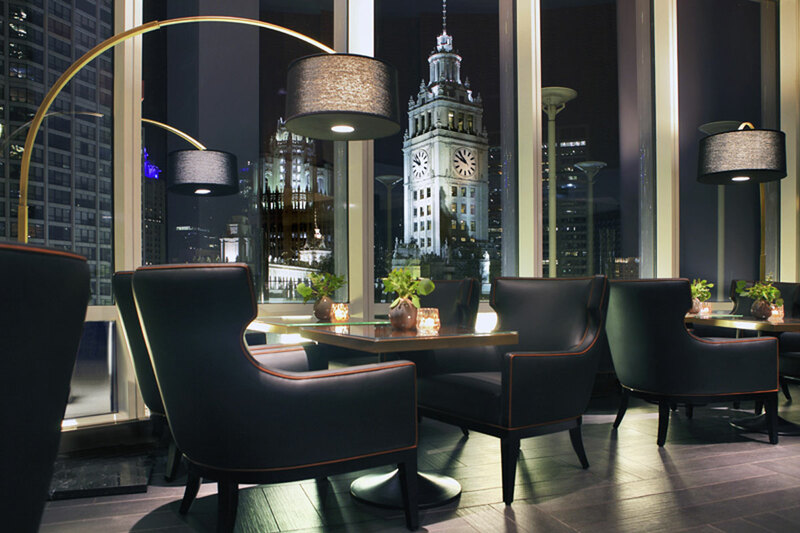 Our restaurant Terrace 16 captures the spirit of Chicago’s glorious summer months year-round with genuine hospitality, warm design, convivial bar, unmatched vistas and an ever-changing menu whose ingredients shine bright. 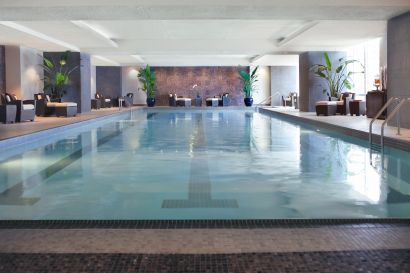 If it is a calm haven you seek, the Spa at Trump®, a 23,000 square foot oasis, invites you to relax and rejuvenate. With 12 treatment rooms featuring signature gemstone treatments and Natura Bissé products, every experience will feel truly luxurious. 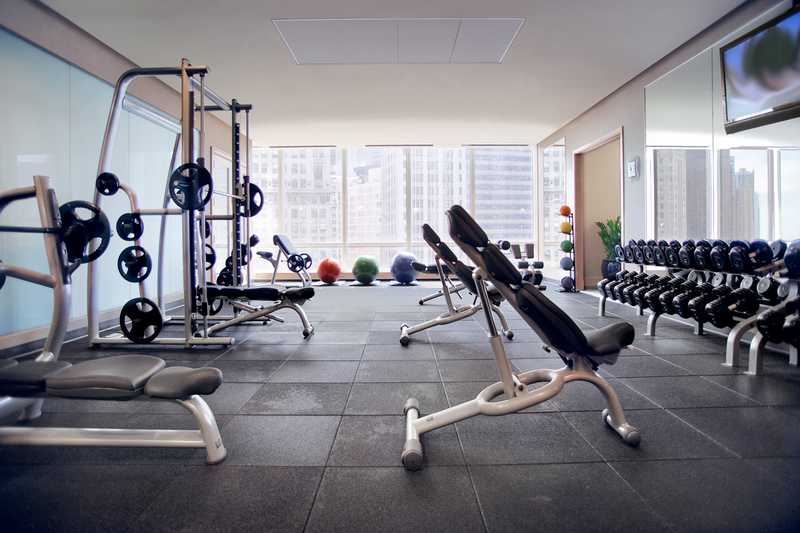 In conjunction with the spa is the large Health Club with separate cardio and weight rooms. – Attaché® delivers personalized attention without intrusion, where desires are intuited and requests are anticipated. – Trump Kids Program – We pride ourselves on being among the best family friendly hotels in Chicago with our Trump® Kids program that offers fun, kid-friendly services and amenities designed to help make your next family vacation a big hit. – Cadillac house car – based upon availability for transportation within 1.5 miles of the hotel. – Trump Wellness – Its three pillars: Nourish, Travel Fit and Quick Bites deliver healthful dining options and custom workout programs in addition to workout gear upon request. 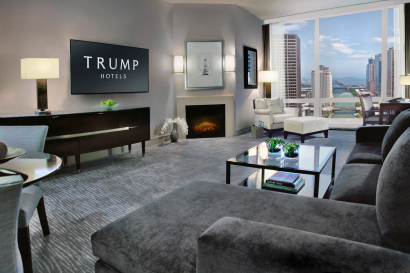 – Trump Pets – Your furry jet-setter will feel welcome with gourmet treats, plush sleeping accommodations and more. 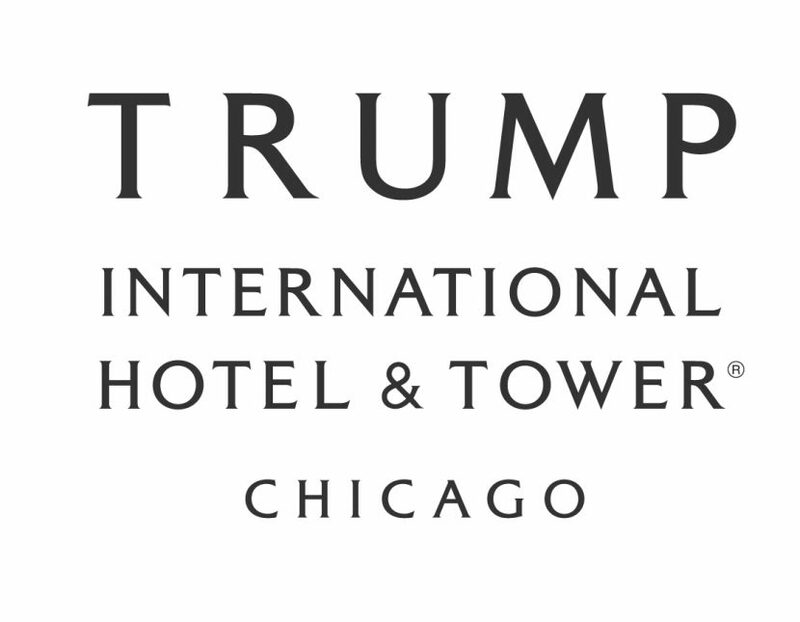 Trump International Hotel & Tower is located in the bustling River North. 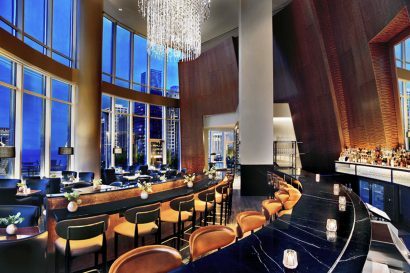 A stylish neighborhood located in the heart of the city, bordering the famous Magnificent Mile and Chicago’s financial loop, River North is the place to see and be seen. This popular district is the go-to for guests who appreciate fine arts, shopping, trendy restaurants and artisanal cocktails. Magnificent Mile, Chicago River Walk, Chicago River cruises, Millennium Park & Maggie Daley Park, the Pritzker Pavilion, Grand Park, Navy Pier, The Art Institute of Chicago, The Field Museum, Shedd Aquarium, Adler Planetarium, Chicago Theater District, Cloud Gate (The Bean), Willis Tower Skydeck and Hancock Building 360 Chicago, music venues, sports venues, shopping, fine dining and much more! – Trump Tower was designed by Skidmore, Owings and Merrill, the same firm which had previously designed the Willis Tower and the John Hancock Center in Chicago. – Adrian Smith was the chief architect who had previously designed the Jin Mao Tower, Burj Khalifa, and Kingdom Tower in Riyadh. – The design of Trump Tower incorporates three setback features designed to provide visual continuity with the surrounding skyline, each reflecting the height of a nearby building. The first setback (16thFloor Terrace), on the east side of the building, aligns with the cornice line of the Wrigley Building to the east; the second (29th Floor Terrace), on the west side, aligns with the Marina City Towers to the west. The third setback (51st Floor Terrace), on the east side, relates to 330 North Wabash building (formerly known as AMA Plaza). – Trump Tower was featured in many movies and documentaries such as the 2008 film The Dark Knight, 2011, Transformers: Dark Side of the Moon. Discovery Channel series build it bigger titled “High Risk Tower”, Weather Channel episode called Megastructures titled “Tornado Tower”. You could watch both documentaries on YouTube. For our younger guests at our family-friendly hotel in Chicago, we offer a special travel program designed to help make your next family vacation a big hit. Kid-friendly amenities like kiddie cocktails, coloring books and no-tear bath amenities are just the beginning. • DELUXE GUESTROOMS. These well-appointed 600 square feet guestrooms have ten foot floor-to-ceiling windows displaying spectacular views of Lake Michigan, Chicago River, or City Skyline. All of our Deluxe Chicago hotel rooms feature fully equipped kitchens, luxurious king-sized beds, Limestone baths, and 42-inch flat panel HDTV with DVD player. • SPA GUEST ROOMS. Every detail encourages guest to unwind and indulge. 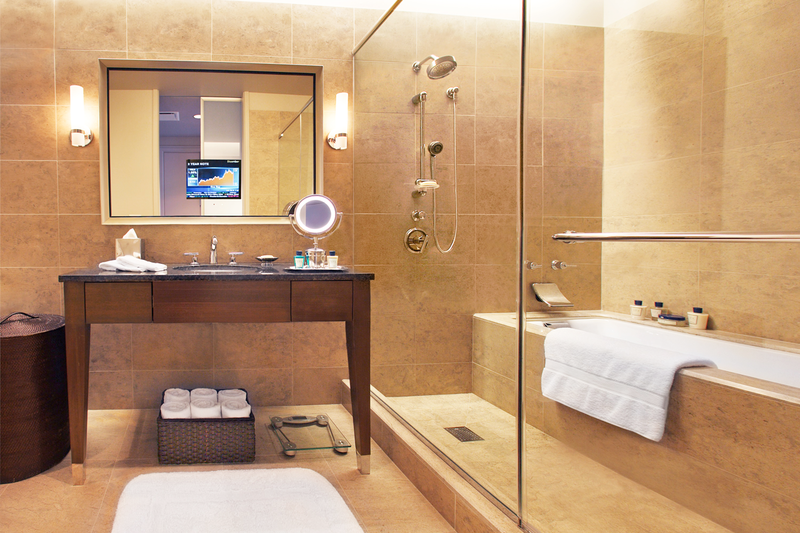 Each one of our 53 Spa guestrooms offer the ultimate retreat. Secluded on two floors, these rooms offer direct access to The Spa at Trump. Calming décor and thoughtful amenities, such as a heated eye and neck pillows, will aid in guests’ escape, seducing the senses while transporting guests to a unique spa lifestyle experience in Chicago. • DELUXE SUITES. Our spacious Deluxe Suites range from 1,080 – 2,200 square feet, featuring a separate living room with a contemporary marble surround fireplace. These spacious luxury suites in downtown Chicago offer luxurious king beds, large closets, master bath, and a guest bath and full kitchens. • GRAND DELUXE SUITES. These extremely spacious Grand Deluxe Suites range from 1,663 – 3,150 square feet featuring grand living & dining areas and fully equipped kitchen with appliances by Sub-Zero and Miele. Terrace 16 captures the spirit of Chicago’s glorious summer months year-round with genuine hospitality, warm design, convivial bar, unmatched vistas and an ever-changing menu whose ingredients shine bright. The 16th-floor restaurant features, a bustling indoor bar and dining room, as well as expansive outdoor seating on its idyllic terrace – all punctuated by breathtaking views of the Chicago River and the city’s most iconic architectural landmarks. Terrace 16’s menu features vibrant, new American flavors, allowing ingredients to speak simply and powerfully for themselves. An extensive craft cocktail program and thoughtful wine list by Sommelier Parag Lalit enhance the experience. 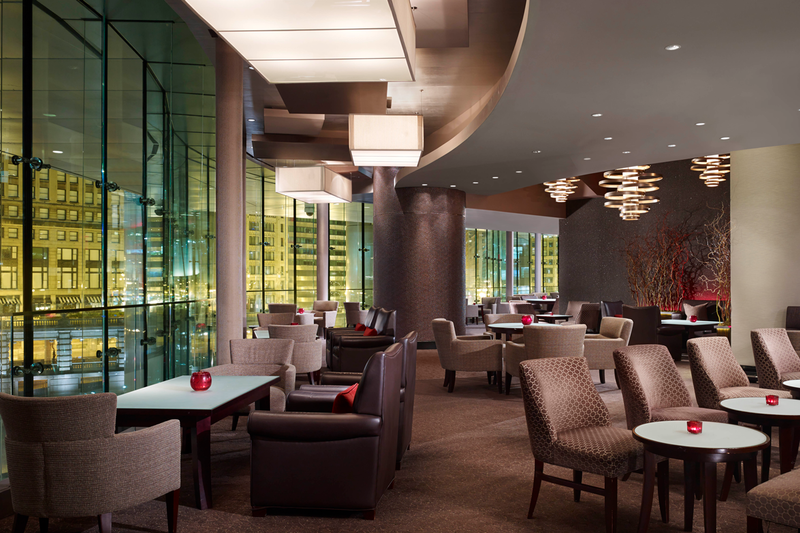 Rebar, a sophisticated lounge located on the hotel’s mezzanine level offers a vibrant, social atmosphere with a savvy mixology program and an exciting Asian inspired menu ideal for sharing. Picturesque views of the Chicago River and the Michigan Avenue Bridge lend to an unforgettable visit. 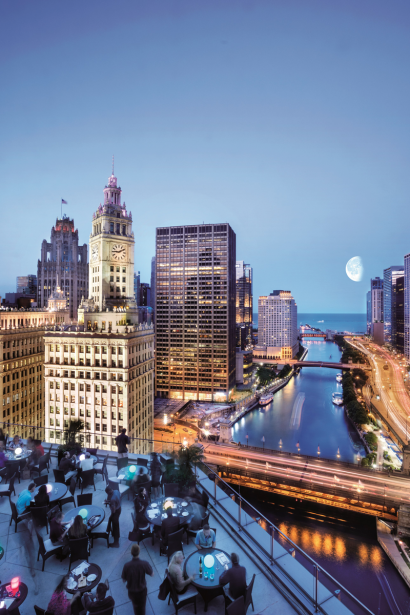 Each event venue offers spectacular lake, river and city views, showcasing Chicago’s historic architectural landmarks. Our professionals will guide you through the entire planning process, leaving no detail overlooked, offering the skills and expertise needed to make your event a success.